Fifth-graders in lower ManhattanMeghan Grupposo never planned on becoming a teaching artist. She graduated from Juilliard in 2000 and went on to dance and choreograph for the Chamber Music Society at Lincoln Center. But a stress fracture from her senior year of high school kept coming back. “I needed to find another avenue to live my passion," she says. Fortunately, her Juilliard ballroom instructors, Pierre Dulaine and Yvonne Marceau, were holding auditions for teaching artists. “I was mortified at the thought of having to speak in front of people," Grupposo says—a severe challenge for any would-be educator—but she got the job with Dancing Classrooms and now teaches 16 ballroom dance classes per week to public-school students across New York City. Like all successful educators, she had to learn that classroom settings require a very different skill set from the traditional dance studio. The key to success, says Miki Ohlsen, artistic director of Island Moving Company, is understanding that students in public-school dance programs aren't self-selecting. “In a studio, they want to be there," she says. “But in our outreach programs, we have to find ways to engage each and every student, some who don't want to dance, maybe haven't had breakfast or don't have warm clothing." Her company does this by making its curriculum directly relevant. “We talk about what gives us our motivations: poetry, news articles or the world around us. 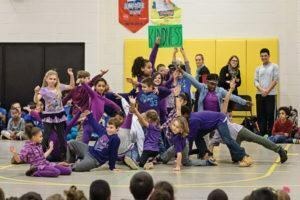 Then we build a dance just like we would build text, using verbs or action words to tell a story." Middle school ballroom partnersRodney Lopez, a teaching artist with Dancing Classrooms who now serves as its executive director, urges his educators to remember that mastering technique is not the goal. “You have to impart more than technical skill. You have to be a coach, a facilitator, a source of inspiration and a joyful mentor. Technical mastery will happen along the way, but it's not the point." So, when Grupposo encounters reluctant male students, she might refer to Victor Cruz's dance moves in the end zone. Then, she helps them to see that learning to dance is a transferable skill. “We talk about the pivot turn, for example. How else will you use it? In basketball." “The work of a teaching artist is incredibly rewarding, but it's not easy," says Lopez. “You have to put in the personal work so you can bring your best self to the classroom and bring the best out in these kids." Grupposo refers to this as becoming “triggerless." “If they push, we're not gonna push back," she says. “Nothing the students say is wrong." While a dance teacher working in a studio environment might reprimand students for making too much noise, Grupposo works to maintain a positive environment throughout her entire class. She thanks her students for being quiet, even when they're being loud, and asks them to face front by saying, “I need all your beautiful faces toward me. You look amazing!" Her classes emphasize respect and teamwork, reinforcing Dulaine's Dancing Classrooms principles of compassion, humor and joy. A similar philosophy informs the work of teaching artists at National Dance Institute. Although founded by famous New York City Ballet dancer Jacques d'Amboise, the organization doesn't teach ballet per se. “We believe that every child deserves to dance, and that every child can dance," says Emily Meisner, director of professional development. Language plays a huge role in student engagement. 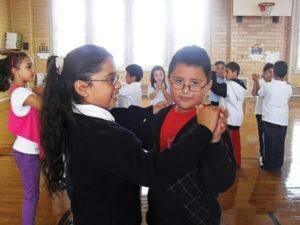 This can be tricky when teaching a form like ballroom, which has a long history of strict gender roles. Dancing Classrooms tries to ensure that classrooms have a relatively even split between males and females. But Grupposo calls them “apples" and “oranges," or “inner circle" and “outer circle" dancers. “We did some Title IX work to see how we could gender neutralize," she says. “Some of the schools ask for it outright. And even though we use the terms 'ladies' and 'gentlemen,' our students get to decide where they fit on that scale." One child, for example, had recently come out as transgender. He insisted that he was a boy and wanted to be referred to as such. Grupposo was happy to honor this request. At NDI, Meisner encourages her trainees to be larger than life in their movements. “If you want the dancer to do 100 percent, you have to do 150 percent. What a child sees is as important as what you tell them." Island Moving Company leads a residency at Claiborne Pell Elementary School in Newport, Rhode Island.In a typical NDI class, students change their orientation at regular intervals. The lack of “front" and “back" reinforces the philosophy that every child can dance, because there's no way to hide “less talented" dancers in the back row. It also keeps children engaged. “They never know when they're suddenly going to be at the front. They don't get to hide, and they don't get to follow." At Dancing Classrooms, Gruposso uses a variety of classroom management techniques including call-and-response (she claps a rhythm, and the students play it back), physical shapes and gestures. “Schools are structured in such a way that people with certain kinds of talent move to the top," Lopez explains. “If you don't fit into that mode of logical intelligence—if you have kinesthetic or artistic intelligence instead—or if you're labeled as 'special needs,' you're going to be tracked for a less ideal experience." Kat Richter is a freelance writer and professor of both cultural anthropology and dance. She lives in Philadelphia.